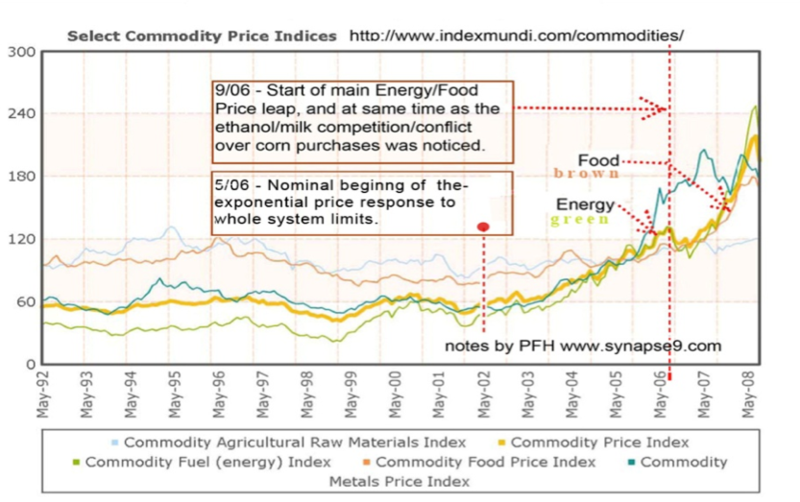 One of the recent economic behaviors an economy is never supposed to exhibit is the way the prices of food and fuel ...began a rapid exponential divergence from their prior stable level for the 6 years from 2002 to 2008. They increased at ~25%/yr, until the world economy collapsed. They seemed to be following some altogether new “law of unlimited price” instead of the usual “law of supply and demand”. That’s not supposed to happen. When demand exceeds supply, the increase in price is supposed to stimulate increasing supply and lower the price again. The opposite is what actually occurred, investment increasing and prices rising faster. That produced a progression of successively more radical changes in global price relationships. Continually increasing prices like these would naturally be expected to upset financial expectations and add to what caused the financial collapse. Clearly such a price spiral also is a sign of profound inelasticity in the global economic system as well. Is the world food crisis more important to New Zealand than the world financial crisis? That will be one of the fundamental questions to be asked at the University of Otago's 44th Foreign Policy School next month. HC said that Climate Change's main effect may be upon 3rd world food production. Kjell Aleklett gives a good talk. His position is that Peak Oil trumps ClimateChange..... the temperature bump barely happens, because we run out of oil..
CERA’s interpretation is that US gasoline demand peaked in 2008.. the reasons .. are economic and geopolitical.. rather than .. geologic factors... "peak oil is here". Now that Peak Oil has won, we can forget about global warming, the crash will reduce economic activity such that we wont be able to burn enough carbon to matter. What will happen to those in cold cllimates who need carbon furnaces to avoid freezing? From my experience they will move slower and slower in their cold rooms and then die. In hot climates it aint so bad. When the fans go off we move slower and slower and lie about smoking cigarettes - 3rd world tyrants mercifully allow us fags at $1 a pack. Not a long life but a full one. The house will be full, with the crash people will be crowding into houses. Not so much in the hot tropics where a few hollow blocks and ply and tin can make a house. When food gets too expensive, I guess infants will die first, then women? I am just off to have another cig to ponder it. USA presidents will continue to blather about International law. Pakistani children have learned not to gather in groups when they hear the bomb-drones overhead. Some buzzcut in OK has been taught to bomb groups of people he sees on his screen. I suppose some popular mechanic is working on a silencer for the drones so they can sneak up on groups of kids unheard. .. skilled carpenters at the site earned UK£4.34 a day, and labourers earned UK£2.84. maybe Boing sabotaged the Brazil Airbus? this only really hit the news whenn the indigines killed a bunch of cops they had taken hostage. Garcia's first presidency ended in 1990 with hyperinflation and an unresolved conflict with fanatical Shining Path insurgents. Then a leftist, Garcia had alienated Wall Street by defaulting on foreign loans. Now he is a free-market champion who is opening vast tracts of jungle to oil and gas exploration by companies including France's Perenco SA, Spain's Repsol-YPF and U.S.-based ConocoPhillips. On Wednesday, Nicaragua granted political asylum to a protest leader charged with sedition after the protests. ... "we're nearing the point where there's not enough carbon dioxide left to regulate temperatures following the same procedures." Kirschvink and his collaborators Yuk L. Yung, a Caltech professor of planetary science, and graduate students King-Fai Li and Kaveh Pahlevan, say that the solution is to reduce substantially the total pressure of the atmosphere itself, by removing massive amounts of molecular nitrogen, the largely nonreactive gas that makes up about 78 percent of the atmosphere. This would regulate the surface temperatures and allow carbon dioxide to remain in the atmosphere, to support life, and could tack an additional 1.3 billion years onto Earth's expected lifespan. - Seems we have finally found a purpose.... use Gene Splicing to put nitrogenase into grasses, or dicotyledons. Seems its very hard for the DumbDesigner to fix N.
Smil claimed "the total mass of nitrogenases in the biosphere may be less than a dozen kilograms.."
I think they are finding more bacteria lurking N fixing bacteria but if we want to deal to the atmosphere, we need forests full of it.